I've been using Last.fm since almost a year, and apart from small defects (mostly strange music changes like from techno to Mozart xD) I love the app. 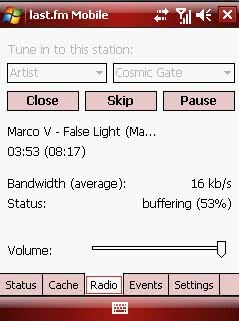 One of the nice features it has is a simple API to interact with their servers and, for example, send your playlists from Winamp, Windows Media Player or even your iPod. But last week, thanks to PedroAfa I found and tested a fantastic app, Last.fm Mobile. 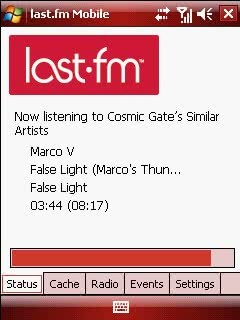 As the name may hint, it is a Windows Mobile version that allows to play Last.fm radios anywhere! 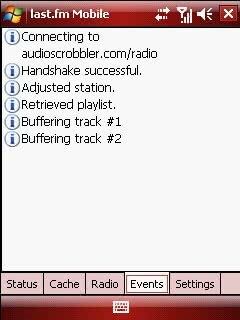 Main window, playing via streaming a song. An events window, very useful to see if anything goes wrong. And the Radio tab, where you type in an artist name or tag and Last.fm searches for similar music. Beware that we are streaming music, if you aren't using wifi it may be quite slow (it buffers before playing so music shouldn't stop even on slow connections).